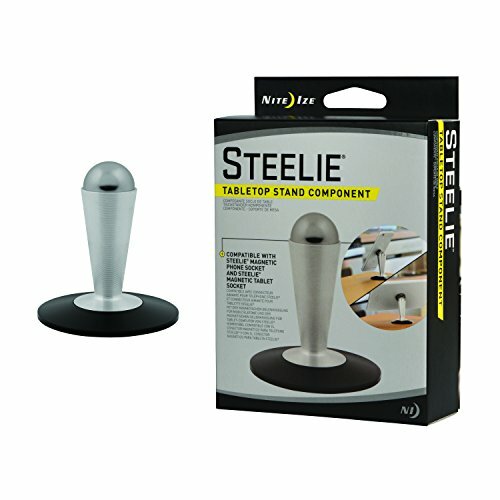 This Tabletop Stand is a component in the Steelie Ecosystem of products and is meant to be paired with a device already equipped with a Steelie Magnetic Phone Socket, Steelie Magnetic Tablet Socket, or with a Steelie FreeMount Bracket (sold separately). It is an ideal pedestal for your phone or tablet on any convenient, flat surface. Think how nice it would be to watch your device hands-free at your desk, on your nightstand, in your kitchen, on an airplane tray table...the possibilities are endless! The Tabletop Stand is machined aluminum with a sleek base fitted with non-slip silicone grips, creating a sturdy podium for your device. It features the signature Steelie Ball for easy articulation with any of the Steelie Magnetic Phone or Tablet Sockets. Nite Ize has been creating innovative, solution-based products with quality, performance and value at the core for over 25 years. Based in Boulder, Colorado, we aim to continue offering imaginative and innovative products that make our customers’ lives easier, safer and more fun."